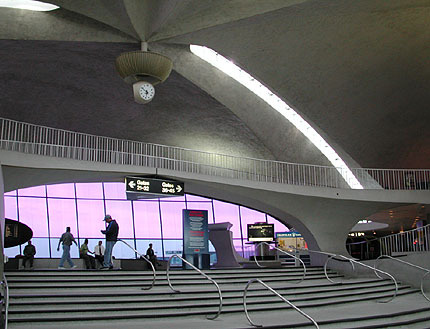 Saarinen's terminal for TWA is sculpted as a symbol of flight - abstract, and not intentionally as a landing eagle as it has often been described. The expressive curves of the design create attractive, spacious halls and a rare degree of exhilaration for an airport terminal. 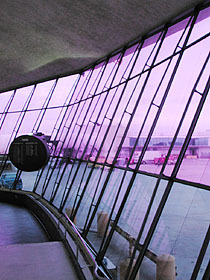 The period bright orange carpets are gone, and the atmosphere is a more contemporary cool with the tone set by the purple-tinted glazing, but the romance of flight is very much alive. 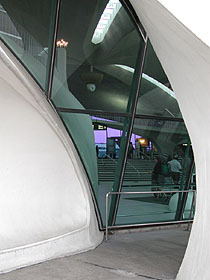 Although the building appears to be made of sculptural concrete, the structure is in fact braced within the concrete by an invisible web of reinforcing steel - comparable to the invisible steel hammock supporting the concrete roof of Saarinen's other 1962 airport terminal building, at Washington Dulles. Saarinen died in 1961, a year before the building was completed. 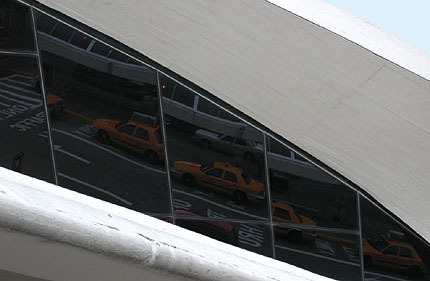 Saarinen's original TWA Terminal, numbered Terminal 5 at JFK, has been closed since the demise of TWA, the airline, in 2001. 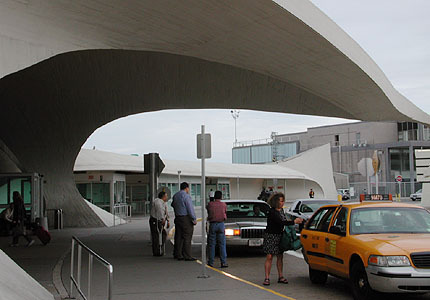 It is being integrated into an expanded terminal for JetBlue, combining the current terminals 5 and 6, in a scheme that partially (but not fully) preserves the Saarinen structure. See more information on plans for this terminal from JetBlue, or read a recent article on what is and is not being preserved in the National Trust's Preservation magazine.